10. 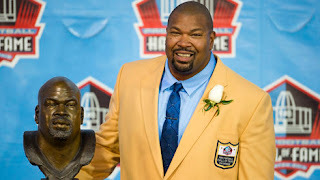 Props to Larry Allen. The mammoth man who always chose quality over quantity when it came to communication delivered a fantastic 16-minute speech to climax his induction. Not many men have joked about drinking a "40 ounce" before slipping on the yellow jacket. But not many players have been as unique as No. 73. Said Allen, "During my career, I didn't talk that much, but I didn't have to. I used my helmet." 9. Man it sure was good to see safety Matt Johnson finally on the field. After a year of leg injuries that totally deleted his rookie year he started Sunday night and made a couple plays and ... Oops. Sprained his left ankle making a second-quarter tackle. MRI today in Oxnard. Dangit. 8. Strange seeing Jason Garrett on the sideline without a hat or sunglasses. We know he got stripped of authority and power in the off-season. But also someone swiped his accessories? 7. Not that a pre-season opener is an indication of anything (the Cowboys have four of 'em in a row for crying out loud). But running the ball 34 times for 170 yards feels like a precursor of things to come under an offense directed not by Garrett, but Bill Callahan. The Cowboys promise to be more committed to the run this season and last night was a bunch of steps in that direction. 6. First-round pick Travis Frederick had his moments playing both center and guard, but his lack of quickness was also evident when he failed to get out on a screen and the linebacker he was responsible for blocking leveled running back Phillip Tanner. 5. Once upon a time when I was snotty-nosed little kid the NFL's first pre-season game featured the defending Super Bowl champs vs. College All-Stars. I'd watch that game today, though no way we'll ever see it again. 4. Jerry Jones was spotted scarfing down two boxes of popcorn. Where is cabana boy/glasses cleaner Shy Anderson when you need him? Thought for sure Jerry would be hand-fed his snacks in Canton. 3. Star of the game was George Selvie, who two weeks ago wasn't playing football. Because of numerous injuries along the defensive line the Cowboys gave a call to Selvie and the 7th-round, 2010 pick by the Rams has been impressive from the jump. Last night he had two sacks, four tackles and three quarterback hurries. Come Sept. 8 he might not be on the roster, but for now he's at least on our radar. 2. Tony Romo didn't play, but he did utter a comment to the media that caught - and cringed - my ear: "I'm not trying to be rude, but you guys don't matter. The game is going to be played out on the field." Truth hurts. 1. Kiffin's "Tampa 2" defense is predicated on creating turnovers. And we all know Dallas forced only 16 during last year's 8-8 Rob Ryan debacle. Last night was a good start, as the Cowboys recovered a fumble and DeVonte Holloman returned an interception for a touchdown. But everybody calm down. The fumble wasn't "forced", it was merely an open-field botch by Dolphins' running back Lamar Miller. And despite his highlight play Holloman, a sixth-round draft pick, remains on the roster bubble. Happy to say I did not watch one second of this meaningless game. rob ryan debacle? despite having an on-air gig with the flagship you clearly weren't paying attention. the defense was decimated by injuries so much so that one would think even a blind idiot like you could see. i will give you a pass as that appears to just be lazy writing. If you watched as closely as I did, you'd have seen blown assignments, 13 men on the field and general chaos. The defense - injuries notwithstanding - was a complete mess. Thanks. Armen Goes to Albany and, Um, Where's Greggo? Walk-Off Homer. Walk-Off Homer. Walk-Off Homer.